Welcome to Fab Friday on this Black Friday!! Hopefully, y'all have done all of your shopping ... and after a NAP you can play along with this week's challenge!! I had a TOTALLY different idea in mind when I started this card ... and in the end it turned into something SUPER simple. It was actually MUCH more complex in my head. I always seem to struggle with "simple" ... so this card kinda made me happy! Have a happy weekend, my friends!! So ... as we are doing the busy-hustle-and-bustle get ready for the annual Thanksgiving Day Feast (at least here in the U S of A), I'm taking a quick "timeout" to come and wish a very happy day to you all ... and tell you how grateful I am for you and the kind comments and support that have been shared with me since I started this blog waaaayyy back in the day!! You have shared so much with me ... ranging from nice comments about things I have created, to prayers and support for me and my family when we have faced difficult times ... AND you have laughed with (AT??) me when I have told ridiculous stories about my life adventures ... you are all the BEST!! 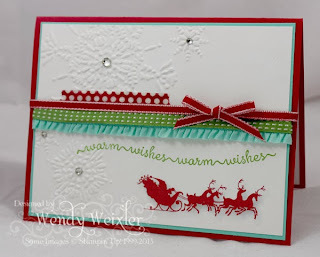 I am sharing a card with you today that I made for my friend and her family. One of our Stampin' Up "family" members, Kimberly Van Diepen, has been at her husband's hospital bedside for over a week since he had some VERY unexpected strokes!! We have all been praying for the Van Diepen's and sending hugs their way ... I KNOW that this is so helpful to those on the receiving end, because I have been there myself (and y'all were there!!)!!! Isn't that what paper crafting and card making are about? To do something you love and share it with others in some form or another? Makes me happy!! Have a WONDERFUL day, wherever you may be!! Ohhhh what fun!!! Seriously!!! 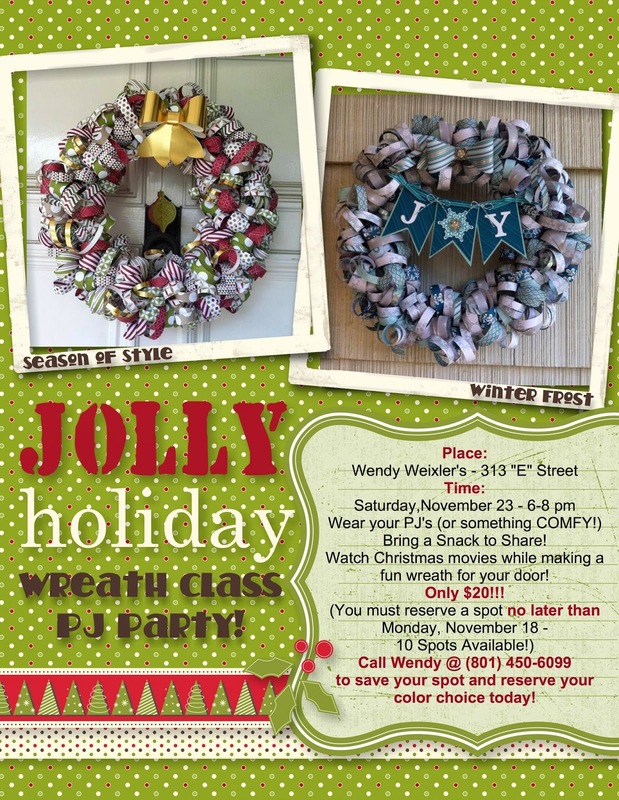 On Saturday I had some of my friends and family join me for a holiday wreath-making class. We had the BEST time!!! 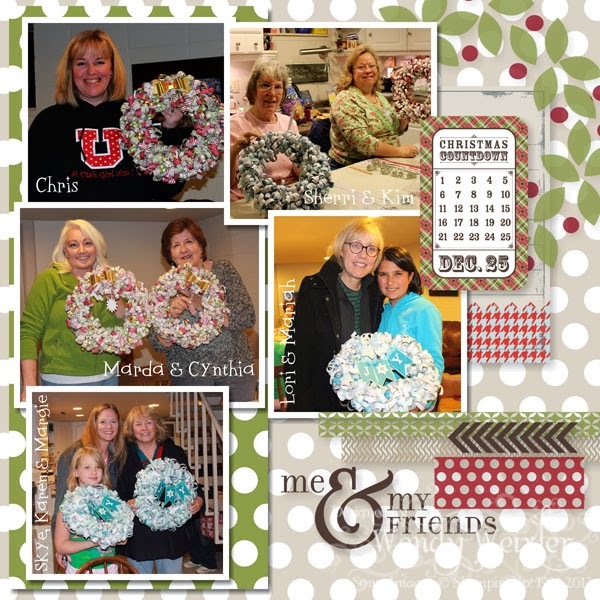 A VERY SPECIAL "shout out" and "THANKS" to my BFF, Bree Renwick (check out HER wreath making class blog post HERE!)!! If it hadn't been for HER, this class would NEVER have happened!! 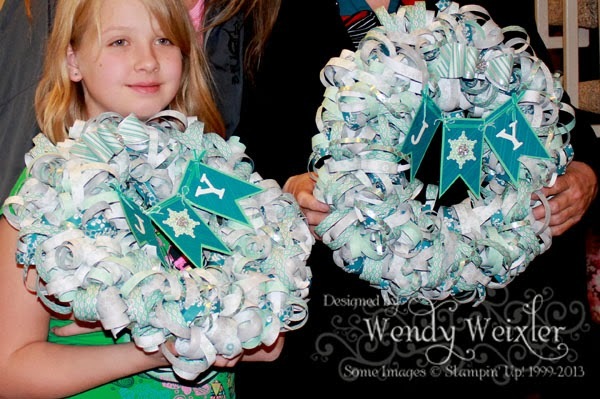 Thanks to lots of encouragement (AND some lovely photos she had already taken of her own gorgeous COMPLETED wreaths! 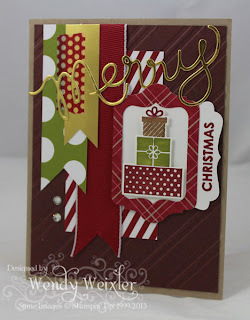 ), I was able to pull a class together ... and boy, am I glad I did!!! I made this wreath AFTER everyone went home for the evening ... well, I started it, anyway!! I got up early Sunday morning to finish it off!! Also, another big THANKS to our fabulous friend, Alanna Wharf ... it was because of HER lovely wreaths HERE that EITHER of us even got started on this to begin with!! I realize many of you have probably already seen these wreaths floating around the web-o-sphere ... they are SUPER DUPER cute!! 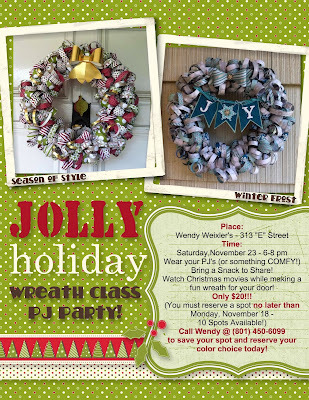 AND they are pretty darn easy to make as well (which is what made doing them with a crowd SO much fun!)!!! I didn't get an actual "close-up" photo of the finished "Winter Frost" wreaths (which were all Bree and Alanna's idea!) ... but here is a picture of my darling little cousin, Skye ... she is a WIZARD with some adhesive!!! Finally, I did a scrapbook page in MDS (My Digital Studio) to remember the event ... lots of laughing, some Christmas movies, good stories, delicious goodies and LOTS of hugs!!! I need to do something like this again SOON!! AND we skyped with Bree's group while they were doing their class at the SAME TIME up by Walla Walla, Washington. I am REALLY bummed that I forgot to take a screen shot of our Skype conversation ... it was so much fun seeing everyone (and, let's face it ... with ALL those women visiting and laughing at BOTH locations, it was a bit noisy!!)!! LOVED it all!! Welcome to the Control Freaks Blog Tour!! This month the Control Freaks are celebrating Christmas in STYLE!! If you just come from the EVER-amazing Dawn Olchefske!! LOVED the little bit of bling she added to BOTH of her projects!! 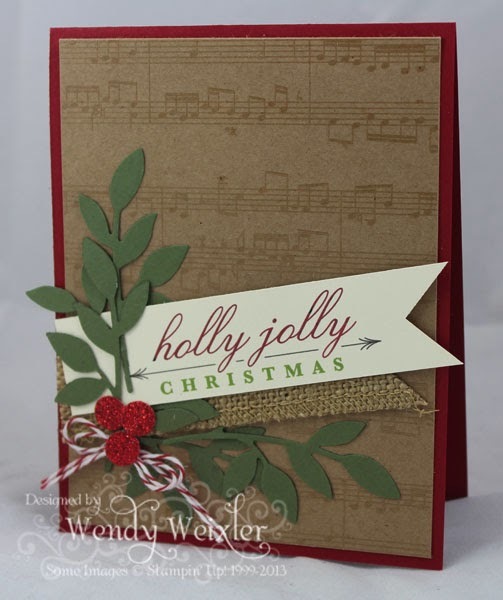 BOTH of my creations are a "Holly Jolly" Christmas cards! (Didn't realize they BOTH said that until AFTER I had created them!! I love the old-time-y feel of the Naturals Composition DSP music sheet behind this one. I created the "banner" using MDS (because if I can't find what I need in my stamp cupboard, I SURELY can in my MDS library!)! 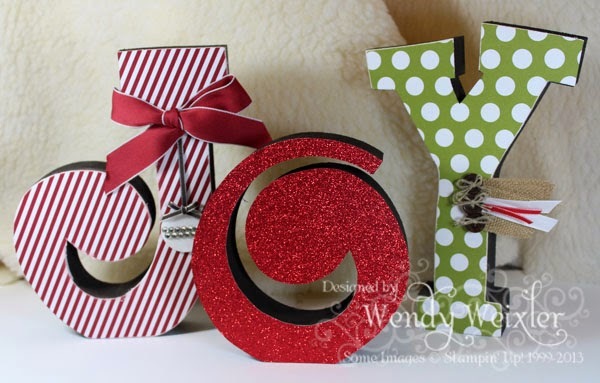 Next up, a little bit of the same kinda color combo ... a little more "Holly Jolly" ... but with a little bit of red glimmery paper!! I'm started to actually get EXCITED about the upcoming holiday season, aren't you???? Next up? My BFF, Jan!! Her cards are GOJUS!!! Click on the "back" button below to see Kaitlyn Zumbach's happy creation ... on the "next" button to see Amy O'Neill's brilliance! "The hillllllssss are aliiiiiive, with the sound of muuuuuusic!" Okay ... sorry about that!! I couldn't help myself!!! I just felt like singing while I was making this card for Fab Friday this week ... and I guess I haven't been able to shake that urge!! Here is the sketch we were working with this week. I LOVE to see what different people do with the same starting point ... which is why I love me a good sketch or color challenge (or ANY place that gives you something to work with when you start!) Sometimes just a little motivation is all we need to help spark our creativity, right??? Happy Wednesday!! I was looking back though some of my photos and came across this ... it was one of my Convention Display Board samples and I FORGOT to ever post it!!! YIKES!! 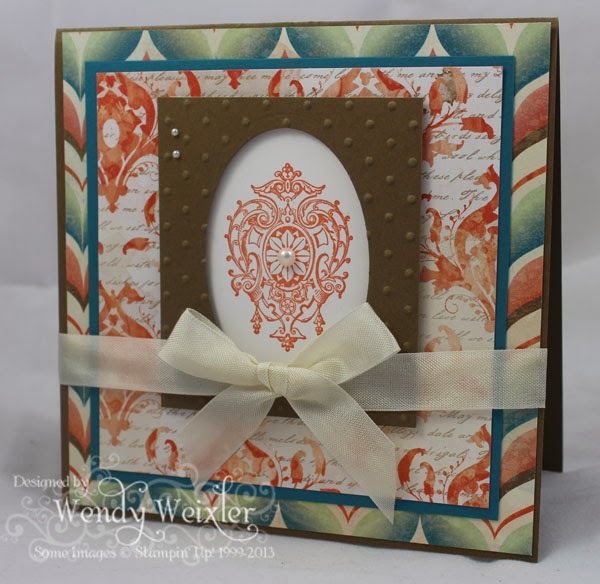 I made this card with things from the "Venetian Romance" suite. There is almost NO stamping (just the focal image). 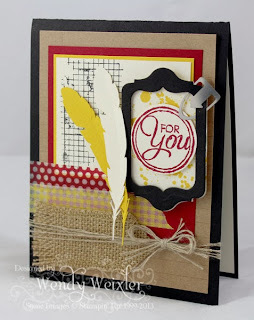 The rest of this is just designer series paper ... isn't it LUVerly???? I started my online Body Pump fitness challenge on Monday ... isn't it FUN when we discover entire GROUPS of muscles that we forGOT we even OWNED??? SERIOUSLY??? My deltoids are hurting when I RUN??? What is up with THAT??? Everything is apparently connected to everything else ... it's GOOD pain, though, RIGHT???? Sheesh!! LOVING this beautiful fall weather we are having here in Utah ... the trees are still hanging on to some of the lovely leaves ... although I noticed on my run this morning that many of the trees were already totally bare ... sigh ... Ol' Man Winter is on his way! Who's with me??? 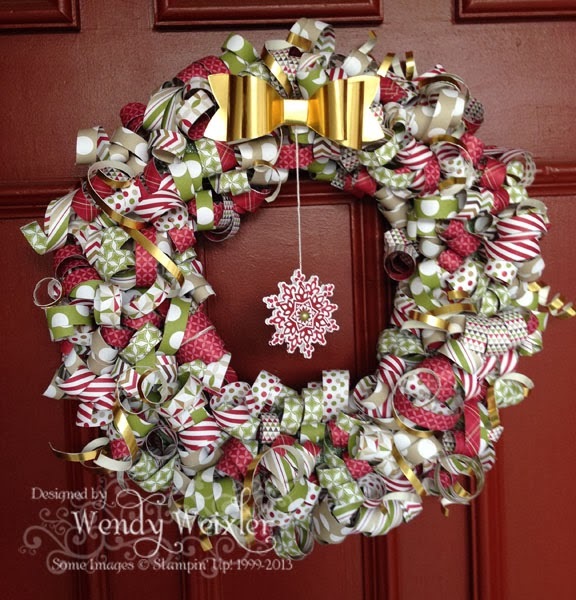 I've seen SOOOO many of these wreaths made this year ... aren't they DARLING???? Who wants to come and play??? Hope to see some of ya there!! Oooooo!!! Aaaaahhhhh!! I have been LOVING the foil sheets that Stampin' Up has in their Holiday Catalog!!! SHINY!!! PRETTY!! FUN!!! 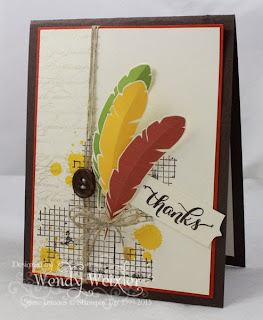 I made this card for the most recent Control Freaks card swap (many of you may not know this, but we started out YEARS ago as a swap club ... still going strong!! The Blog Tour is just a fun "side" thing we do!)! The Expressions Thinlits dies are also a new fave of mine ... LOVE 'em!! I also used this as a sample for today's Free for All Challenge over on Splitcoast. As many of you may know, I've been seriously getting in to running this past year (and falling ... down manholes ... but that's a whole DIFFERENT story!)!! I am starting to train for a half marathon (I have clear until next summer, actually, but I am hoping to be ready enough that I can do at least ONE before then!)! This Monday I am also starting a weight lifting/toning challenge with a group of people online (yeah-yeah-yeah ... a lot of my friends DO live in my computer!)! 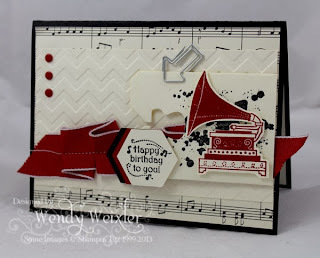 I expect to be VERY sore over the next several weeks ... hopefully I will be able to lift my arms up to the keyboard so that I can at least continue blogging ... and STAMPING!! OHMYGOSH!! I also hope to be able to lift my hands up to my craft table!! YIKES!!! 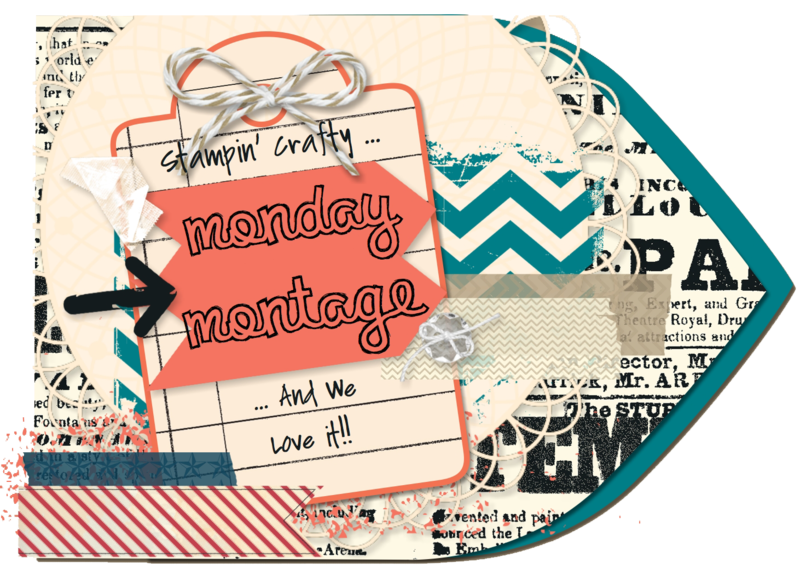 Welcome to another Monday Montage!! I guess 'tis the season because it SNOWED today!! It didn't really stick much in our neighborhood, but it really did look pretty coming down on top of the fall leaves. It kinda got me feeling all holiday-ish ... and I WILL admit that I started listening to Christmas music on November 1 (ok ... haters don't be hatin' ... I really LOVE my collection of Christmas music and 30 days just isn't enough time to really enjoy it for me!!)! I started by tracing the letters on to the patterned papers I had chosen. Then, I painted the letters a lovely Early Espresso-ish kind of color. The rest was easy ... once the paper was adhered to the letters (after they had dried, of course), I sanded the edges of the paper so that they would be flush with the wood. 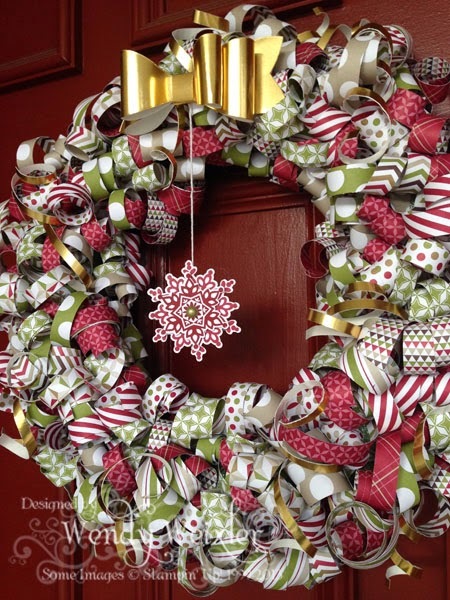 Add a little bit of bling and ribbon, and VOILA!! Easy cheesy!! 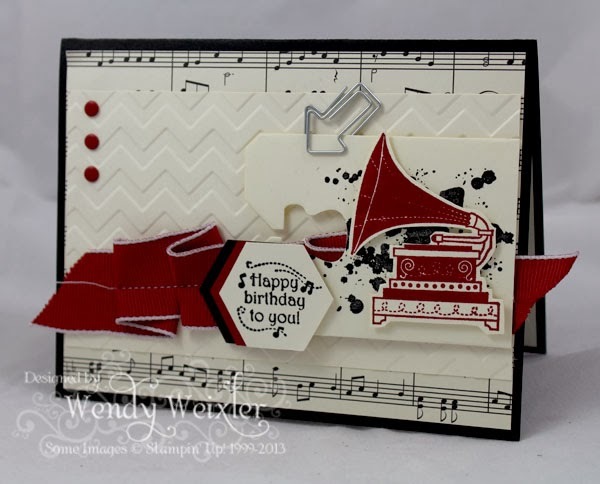 Hit the "Next" button to check out what Amy O'Neill has come up with, or the "Back" button to check in on Melissa Stout! Ooooooo! Look at ALL the pretty colors!! I love me a purdi-fied color challenge, and this one is it! I played with the Woodcut Feathers in MDS and printed me out some feathers for my creation ... and I'm getting excited about them. Think I'm gonna have my eCutter make the next batch, instead of printing them out and cutting them myself!